HiPer SR now has 2 variants: basic with LongLink (current model) and the new HiPer SR with Integrated Cellular Modem. For more details on these 2 variants, please check the FAQ in the Sales tab. In addition to ruggedness, the HiPer SR is the most versatile configurable, compact receiver system available. Use just 2 units in many configurations, depending on the demands of the project site. Use as a job site base and rover with interference-free LongLink communication up to 300m, or base and rover with MAGNET Relay cellular communication RTK up to 35km baselines. A pair of HiPer SR receivers can also be used as 2 network rovers with internal SIM cards, 2 network rovers with internet capable field controllers, 2 dual frequency static receivers, or in conjunction with a robotic instrument for Hybrid Positioning. All these configurations from just 2 receivers that can fit into any laptop carrying bag. That’s versatile performance! Topcon’s HiPer SR provides you the power to work through the toughest conditions all day long, and then some! 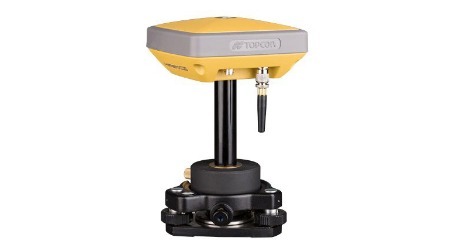 It’s Topcon’s leading edge GNSS technology in a smart, compact, ultra-rugged package. With it’s lightweight design and magnesium housing the HiPer SR is guaranteed to survive a 2m on the pole drop to concrete. And the sealed long-life power supply keeps you working for up to 20 hours between charges. The best part? HiPer SR will fit your budget just like it’ll fit your jobs. ..with ease!